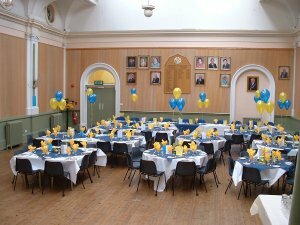 Towcester Town Hall is conveniently situated in the centre of Towcester and is available for hire to individuals, groups and organisations. The main hall can accommodate 170 people and its stage makes it an excellent venue for concert-style performances. There is a newly refitted kitchen, accessible from the main hall, which can also be hired. Charges and conditions for hire of Towcester Town Hall with effect from 1st April 2017.